Background: While most bariatric surgeons try to help patient achieve a realistic goal weight after surgery, patients are often disappointed that they have not reached “ideal” body weight. We propose that this is because patients begin the surgical process with inflated self expectations and set themselves up for disappointment. Methods and Procedures: At the University of Texas in Houston, we recorded the patient expected % excessive weights of 125 preoperative gastric banding patients and 36 gastric bypass patients. Frequencies of expected weight loss were graphed for different percentages of weight loss. Patient expectations were separated by gender and compared using Student’s t-test. 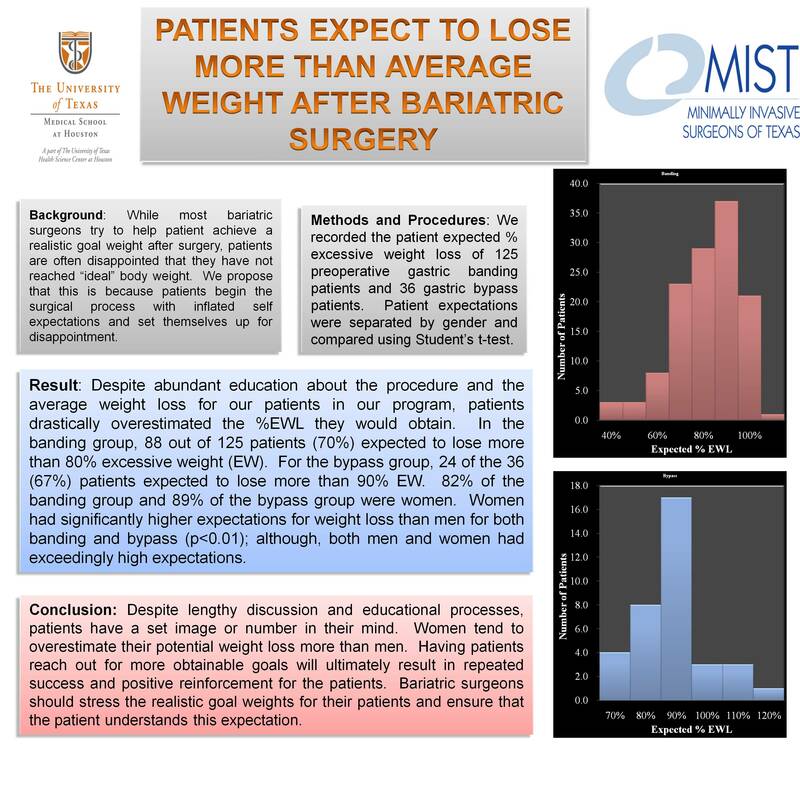 Result: Despite abundant education about the procedure and the average weight loss for our patients in our program, patients drastically overestimated the %EWL they would obtain. In the banding group, 88 out of 125 patients (70%) expected to lose more than 80% excessive weight (EW). For the bypass group, 24 of the 36 (67%) patients expected to lose more than 90% EW. 82% of the banding group and 89% of the bypass group were women. Women had significantly higher expectations for weight loss than men for both banding and bypass (p<0.01); although, both men and women had exceedingly high expectations. Conclusion: Despite lengthy discussion and educational processes, patients have a set image or number in their mind. Women tend to overestimate their potential weight loss more than men. Having patients reach out for more obtainable goals will ultimately result in repeated success and positive reinforcement for the patients. Bariatric surgeons should stress the realistic goal weights for their patients and ensure that the patient understands this expectation.